Sparks fly as Dan Hensley pours liquid iron (at 2575 degrees Farenheit) into the mold for a piano plate destined for Steinway pianos, at O.S. 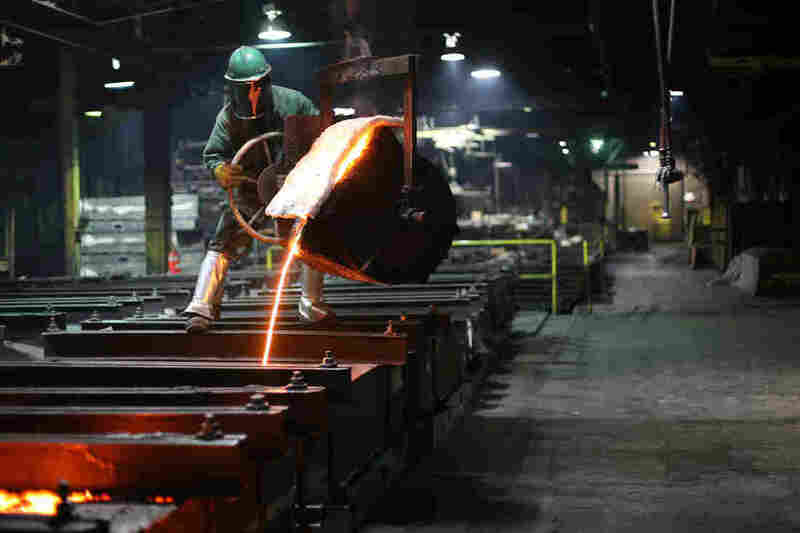 Kelly foundry in Springfield, Ohio. The Steinway piano company has a new owner. This fall, the investment firm Paulson & Co. — led by billionaire John Paulson — spent about $500 million and bought all of Steinway & Sons, the venerated piano maker. 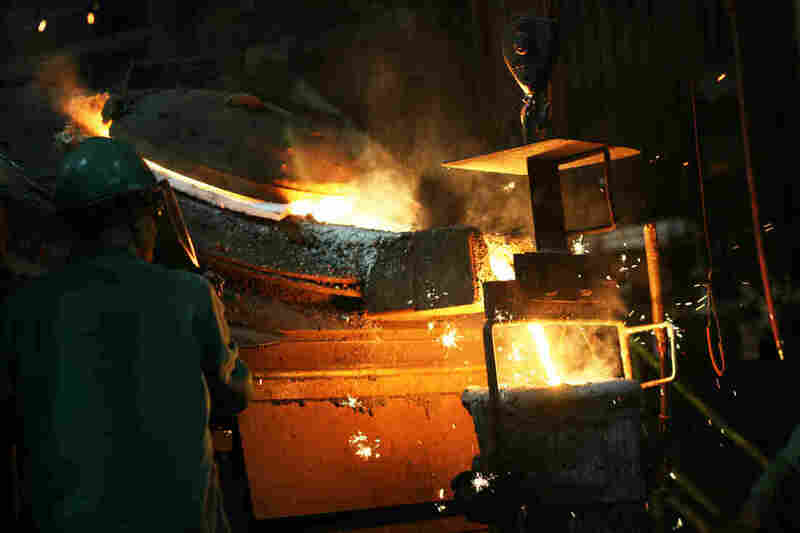 The deal includes a foundry in Springfield, Ohio, where the Steinway pianos are born in fire. The O.S. Kelly Foundry has been making Steinway's plates since 1938. The plate is the cast-iron heart of a piano: It holds the steel wire strings with 40,000 pounds of tension, the company says. It allows vibrations to arise in a concert hall as music. The plates are an old design. So is the Kelly foundry. Even the dust in this dark, echoing space seems a century old. This part of the operation is the "melt shop," where two men pour cast-iron plates for all the Steinway pianos — that's 4,000 plates a year. 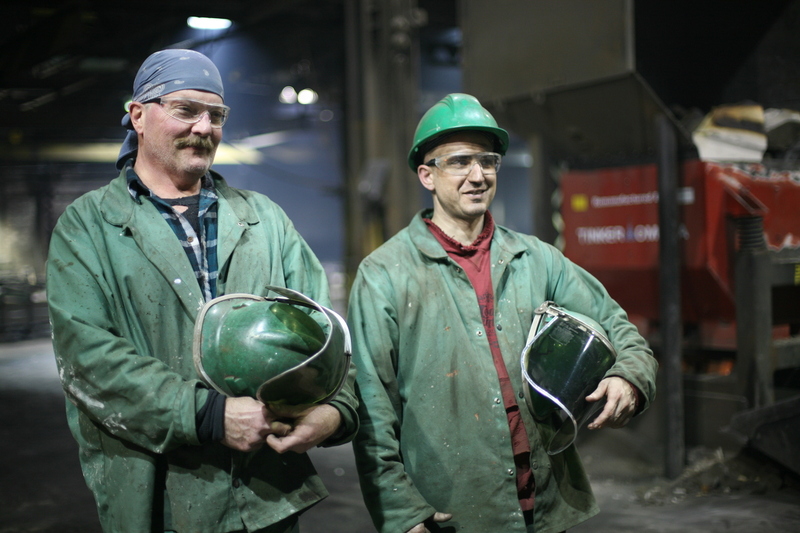 The whole process of pouring of the cast iron is the work of two men: Dan Hensley (left) and Ryan Houseman. The melting starts at 11 p.m., and by midnight, the furnace is clanking and throwing off showers of sparks. "Got 13-hundred pounds of steel," says Dan Hensley, one of the men working in the shop. "Behind that goes 13-hundred pounds of pig iron. And we fill it the rest of the way up with what we call re-melt." Re-melt is made of piano plates that didn't pass inspection and are thrown back in the mix. High overhead, a large electromagnet glides over with the bad plates and hovers above the furnace hopper. Down below, a button is pushed to release the scrap. In charge of loading the furnace is Ryan Houseman, who started in the melt shop a year ago. "The first thing I noticed was all the dirt around here," says Houseman, who's had other jobs at the foundry. "It was a little overwhelming, but I saw them pouring iron, and I thought that was pretty neat." At 1 a.m., the melt is ready to go. 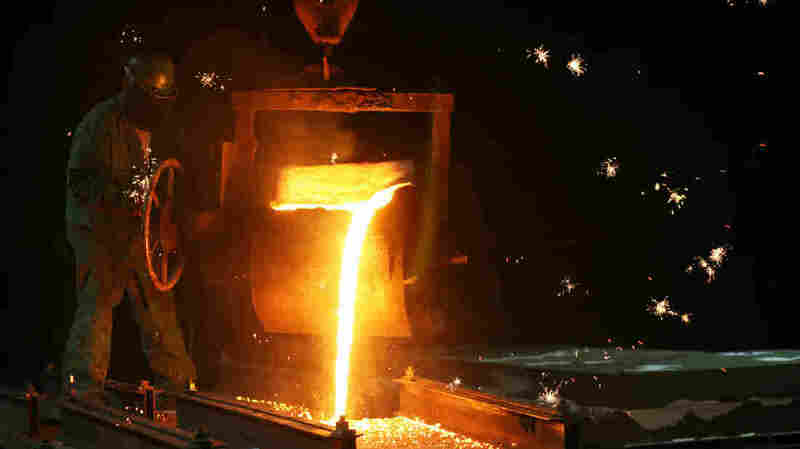 The iron flows into a large, black ladle from the "teapot" spout of the furnace. Ryan Houseman is at the controls of the "teapot" furnace spout as it loads the ladle. Hensley and Houseman guide the ladle, suspended from a system of overhead beams, out to the foundry floor, where the plate molds are lined up. The molds are made of chemically treated sand, which hardens quickly around a form that is then removed, leaving a hollow space inside. The ladle hovers over each mold in turn and tilts. A stream appears and descends into a hole left in the sand. 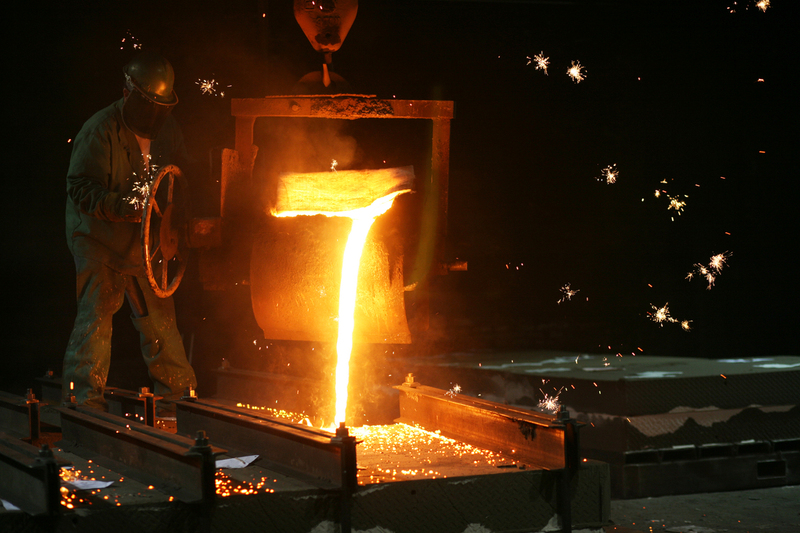 The iron is more than 2,000 degrees Fahrenheit and incandescent, a luminous yellow-orange. The two melt-shop men take turns pouring, like dancers moving on top of the molds. They wear dark visors and flame-resistant shields over pants and boots. Houseman pours molten iron for the plates. 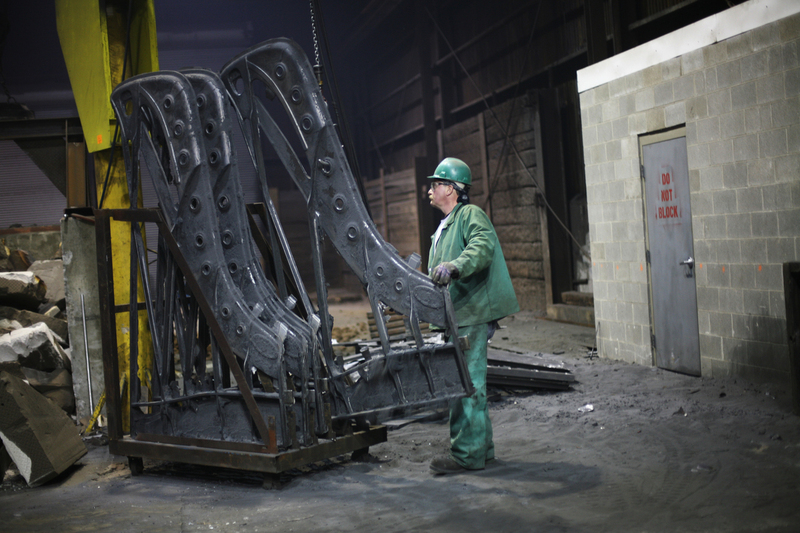 The foundry creates 4,000 cast iron piano plates a year. Hensley, who has been pouring since 1987, had always wanted his wife to see what this job was like. When he did bring her in one night, she saw them climb up on the molds, pushing and pulling the giant ladle. "And the next morning I got home, her first comment was, 'I will never ever complain when you say you're tired,' " Hensley says. Lunch time is 2 a.m. In the first half of the night, 12 molds have been poured (on the day shift, the rest of the foundry staff will take over all the prep work and the shipping). The melt crewmen open lunch boxes in the break room and talk about the job, and injuries. 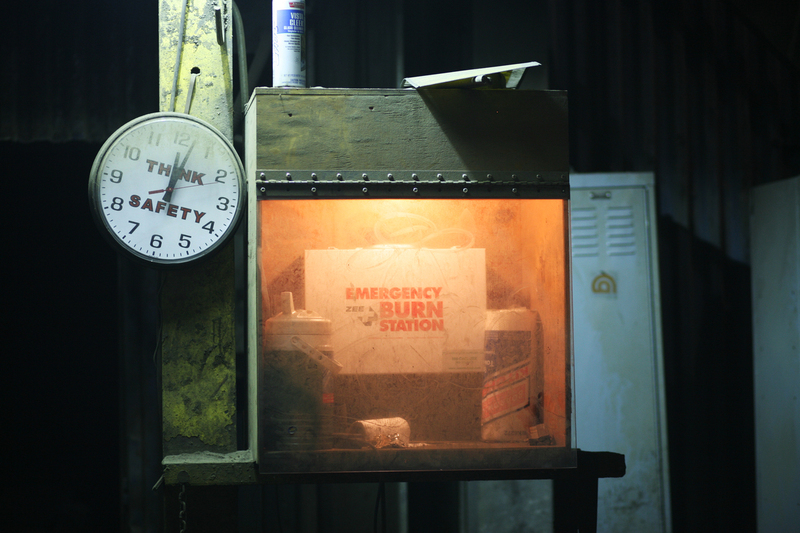 A safety station at the foundry is covered in a layer of dust from the furnace. Safety is a top priority since a small drop of molten metal can cause serious burns. Houseman missed eight weeks of work after being airlifted to a burn center in Dayton. He'd been pouring iron when he turned away, and there was a small spill. "Apparently it started running out and just a little drop went through the back of my pants, down into the bottom of my boot and burnt the bottom of my foot," he says. Hensley says he's had a few droplets, like BBs down his boot. Not that bad, he says. "That's the reason we wear slip-on boots, so you can kick your boot off. If you have a tie up, that's another 20, 30 seconds trying to get your boot off," he says. Six hundred miles away in the Steinway showroom in New York City, a concert grand is priced at $142,500. That gleaming, elegant piano got its real start in the flames of the melt shop. Dan Hensley lines up piano plates just removed from the molds, now off for finishing and painting.